A natural phenomenon is not patent eligible — neither is a man-made items that is identical to a naturally occurring version. The image below sure looks like a natural stone pattern, but is actually an image of an artificial quartz stone slab patented in U.S. Design Patent No. D825,787 that issued in August 2018. 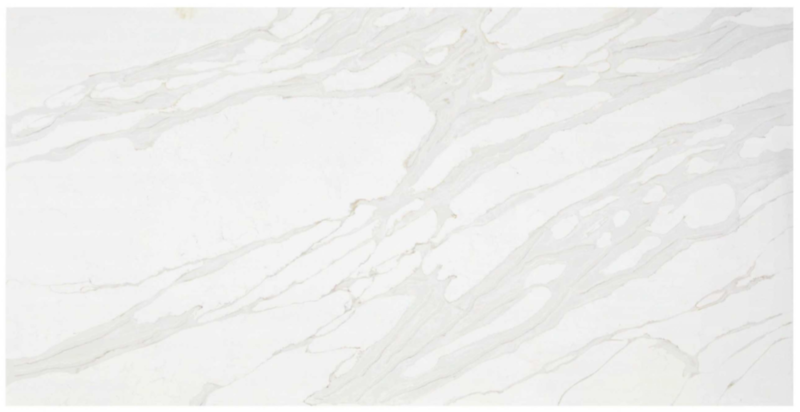 I’ll note here that the patent owner Herostone markets this particular surface under the name “Calacatta Venatina” — a slight variation on the popular italian marble known as Calacatta Venatino. As per usual standard operating procedures, the USPTO issued the design patent in a first-action-allowance without rejection and without citing must of relevance. Cambria Products LLC sued numerous parties for infringement of its design patents and copyrights. Also filed ITC actions. A final decision does not appear to have been reached as the cases were all dismissed(settled). Even though the scope is limited, as someone makes thousands or millions of products with randomly generated marbling, there is a possibility that a few could have a marbling that is the same or substantially the same pattern. There is no way to guarantee that the pattern is not the same on every product manufactured to avoid infringement. If you are trying to avoid infringement, someone would have to inspect the products as they are manufactured. This is not the first time someone obtained a design patent on marble slab or a product with a marble or striped pattern. “Exactitude” is not the driving legal issue here. What is happening here is that this design is not identical to a real-world marble but it is meant to fool a human brain into thinking it is marble. The scope is very limited probably to just this design. This should be eligible for patentability and probably they patented it just to prevent cheap knockoffs, i.e., manufacturers that are such ripoffs they won’t even bother coming up with their own fake design. And, anon, it does not necessarily lack originality. It is original (let’s assume that it is not a copy of nature). Who says it is easy to fabricate a design that trick human brains into thinking it is a marble design? Who says that? A million recipes for marble cake, for starters. Not helpful. Not even funny. “Real world” marble is not identical to itself. I do not think “identicalness” has as much import as you seem to want to give it (in this context). The MPEP section is not “about” identicalness, it is about simulation. As you note, the intent IS to simulate. Is that not dispositive? >> This premise was also applied in In re Smith, 25 USPQ 360, 362, 1935 C.D. 573, 575 (CCPA 1935), which held that a “baby doll simulating the natural features…of a baby without embodying some grotesqueness or departure from the natural form” is not patentable. Well if this is good law, then you are probably right anon. I would imagine a Banker and his buddie. It falls in line with the letters. I can’t wait to find out who was behind all those filings pretending to be me. This is a planar surface that can only be found in a stone that has been cut by human hands. So it’s not a product of nature. Not so, as plenty of planar surfaces of “cut rock” are found in nature. Yeah but, it seems the issue is would THAT pattern ever show up in nature? And would all you need is another pattern not to infringe this patent. “neither is a man-made items that is identical to a naturally occurring” — well the process of making it can be. I would guess if that is an exact duplicate of a natural phenomenon pattern then it should not be patentable, but then how would you ever know that? They could just destroy the original or hide the original. Mimicking natural patterns is an obvious design choice for an artificial rock. Done. I’m copying this design. Come get me. Together we’ll create Supreme Court precedent with your money. What is it that you think that THAT term means in context here? Do you even recognize that the phrase carries more than one meaning in patent law? You answered your own query, it’s copyright law is where it should be filed. That though, has no reach to the point of my post and the fact that the phrase “design choice” has more than one meaning in context of patent law (completely outside of copyright law). But any such overlap is not at point here. (Note as well that “Design Patents” — once again — are more than just a little bit ill-fitted into the (different than copyright) intellectual property set-up meant to protect utility.) The point here though is that even (or perhaps especially), because of that ill-fit, the phrase “design choice” has more than one patent law meaning. This is like arguing that a true-to-life representation of a tree shouldn’t be protectable because… because, well, it’s true-to-life, right? Microsoft chose a specific photo from California wine country (called Bliss) as the default background for Windows XP. That specific image became so well-known as to become practically emblematic of the OS. It became so recognizable that people began to recognize the physical location because of their familiarity with the Windows XP background image, rather than vice-versa. However… it’s just a picture of sky and countryside, right? Neither Microsoft nor the photographer had any hand in sculpting the hillside. It’s just a depiction of nature, hence no protection. Yes, I know that Bliss is protected by copyright, not design patent. Can anybody explain why Dennis’s rationale above should apply to design patents and not to copyright? Why would a representation of nature be entitled to broad protection as an expression, but not entitled to any protection when affixed in the surface of a product to give ornamentation to a functional article of manufacture? 35 U.S.C. 171 requires that a design to be patentable be “original.” Clearly, a design which simulates an existing object or person is not original as required by the statute. The Supreme Court in Gorham Manufacturing Co. v. White, 81 U.S. (14 Wall) 511 (1871), described a design as “the thing invented or produced, for which a patent is given.” “The arbitrary chance selection of a form of a now well known and celebrated building, to be applied to toys, inkstands, paper – weights, etc. does not, in my opinion, evince the slightest exercise of invention….” Bennage v. Phillippi, 1876 C.D. 135, 9 O.G. 1159 (Comm’r Pat. 1876). This logic was reinforced by the CCPA in In re Smith, 25 USPQ 359, 360, 1935 C.D. 565, 566 (CCPA 1935), which stated that “to take a natural form, in a natural pose, … does not constitute invention” when affirming the rejection of a claim to a baby doll. This premise was also applied in In re Smith, 25 USPQ 360, 362, 1935 C.D. 573, 575 (CCPA 1935), which held that a “baby doll simulating the natural features…of a baby without embodying some grotesqueness or departure from the natural form” is not patentable. Therefore, a claim directed to a design for an article which simulates a well known or naturally occurring object or person should be rejected under 35 U.S.C. 171 as nonstatutory subject matter in that the claimed design lacks originality. Form paragraph 15.08.02 should be used. However, when a claim is rejected on this basis, examiners should provide evidence, if possible, of the appearance of the object, person or naturally occurring form in question so that a comparison may be made to the claimed design. Form paragraph 15.08.03 should be used. It would also be appropriate, if the examiner has prior art which anticipates or renders the claim obvious, to reject the claim under either 35 U.S.C. 102 or 103(a) concurrently. See In re Wise, 340 F.2d 982, 144 USPQ 354 (CCPA 1965). Finish the thought, David. Some rich people shove a picture into everyone’s face and so …. They “own” anything that resembles that picture? I can’t take my own picture of the tree? Or what? Microsoft chose a specific photo from California wine country (called Bliss) as the default background for Windows XP. That specific image became… so recognizable that people began to recognize the physical location because of their familiarity with the Windows XP background image, rather than vice-versa. However… [n]either Microsoft nor the photographer had any hand in sculpting the hillside. It’s just a depiction of nature, hence no protection. This is a really good point, David. If the question were whether I would say that a (e.g.) refrigerator with an image of a natural hill scene is excluded under §101, I would definitely balk at excluding the refrigerator from protection on natural product exception ground. In other words, the natural product exception is a red herring here. [I]in the eye of an ordinary observer, giving such attention as a purchaser usually gives, two designs are substantially the same, if the resemblance is such as to deceive such an observer, inducing him to purchase one supposing it to be the other, the first one patented is infringed by the other. in Gorham Co. v. White, 14 Wall. 511, 528 (1871). Imagine that a woman is walking past a store window and sees a refrigerator embossed with the Bliss image. When she gets into the store and sees other refrigerators—some with Bliss and others with other hillside scenes embossed on their surfaces—she will easily be able to pick the one she saw in the window from the others on the show room floor. This proves that a design patent on the refrigerator embossed with the Bliss scene does not also read on the appliances embossed with the other hill scenes. By contrast, imagine that our same hypothetical customer walks past the exterior display window and sees a refrigerator embossed with the D825,787 image. Once she goes into the store, she is met with a variety of refrigerators—some with the D825,787 image, others with veneers of real marble. I very much doubt that, under these circumstances, she can pick out which one she saw in the window outside. That shows that the D825,787 patent reads on natural marble, and is, therefore, anticipated by natural marble. The design claim deserves to fail, but for anticipation, not subject matter eligibility. This dovetails neatly with your recent point elsewhere that most of these natural product cases would be better decided on §102 than §101 grounds.